Adding to your family through adoption is surprisingly expensive. Many parents are surprised to learn that the average adoption costs between $34,00 and $39,000. When adopting a child overseas, the cost of flights, hotels, and other travel expenses can increase your total cost by thousands. Because of the high cost that comes with adopting a child, many families use fundraising as a way to raise money for their growing family. But what type of fundraising is best for you and your family? To help you out, we’ve put together a list of some of our favorite adoption fundraising ideas for you to choose from. 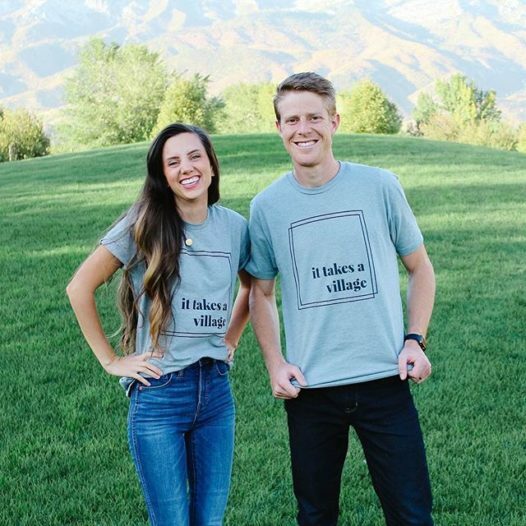 T-shirt fundraisers have helped couples all around the world raise money for their adoption. It’s an easy and fun way for you to share your story with your community, and it allows you to give your donors something tangible in return for their support. 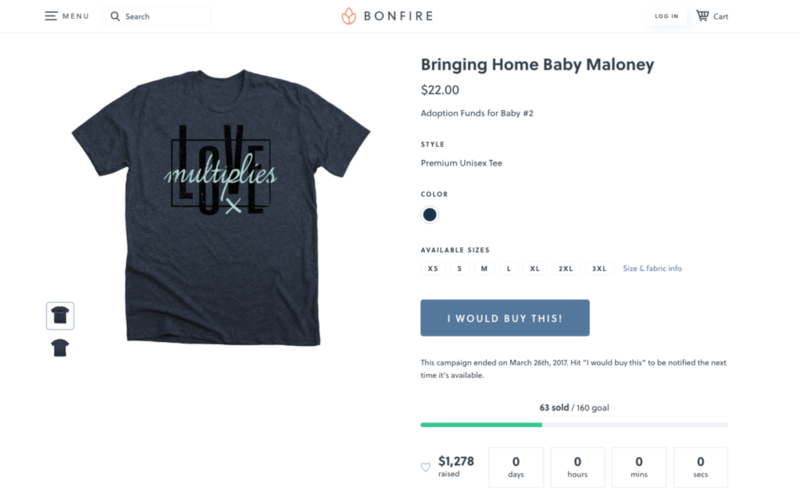 Launching an adoption t-shirt fundraiser through Bonfire is a risk-free, high return option for adopting families because our platform is 100% free to use, and has no upfront or inventory costs. 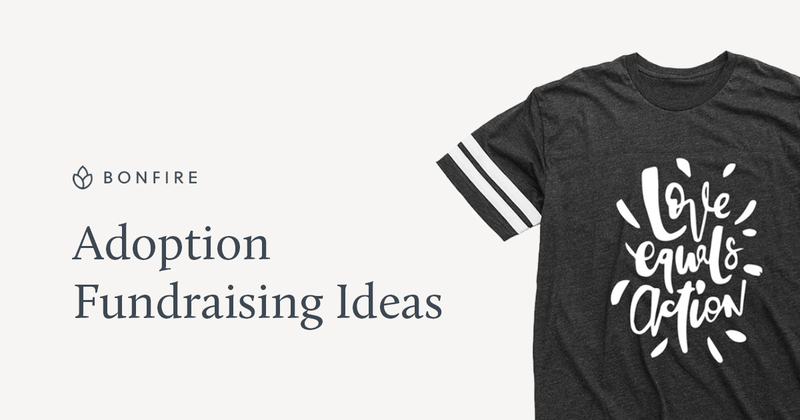 Compared to other fundraising options, t-shirt fundraisers can help you raise so much money without investing a single penny. And the best part about using a company like Bonfire is that all you have to do is create your t-shirt design. We handle printing, shipping, and all other logistics. Upload or create your design in our t-shirt design tool. If you don’t know where to start with your design, check out our free adoption shirt design templates. Rather design your tee yourself? 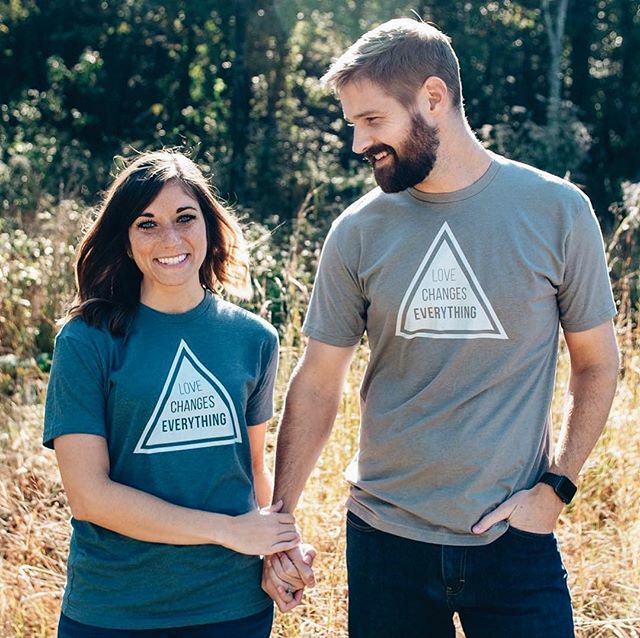 Check out these top adoption shirt design trends for more inspiration. Set the price of your shirts you’ll be selling. Once your campaign ends, we will ship all of your t-shirts directly to your supporters, and you’ll be sent 100% of the profits. Contact a local restaurant or bar and ask if you can set up a charity dinner or charity night out for a larger group. Contact your friends and family and sell tickets to the event. You can sing karaoke, have a trivia challenge, or just enjoy a night out with friends. You can also organize these events around important occasions – like a Superbowl party or the Fourth of July. Garage sales are a good way to raise money and clean your house at the same time. They take quite a bit of time to set up, but with a little hard work between you and your partner, you’ll be able to raise money to cover adoption costs. 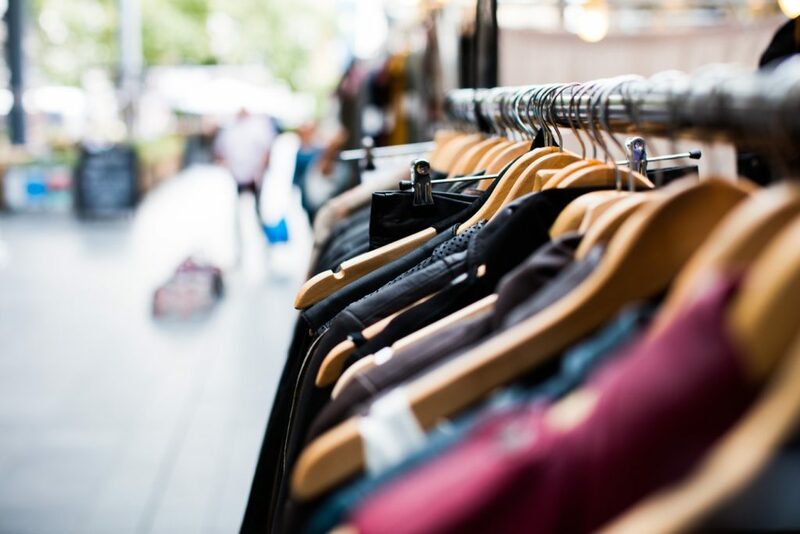 You can even maximize involvement and support for your yard sale by welcoming others to donate their yard sale items to your cause. Gather friends and family together, and anyone else who would be interested in supporting your efforts to adopt a child, for a night of wine and cheese tasting. You can host the event at your house and select all of the wine and cheese pairings yourself. Or, see if you can partner with a local wine and cheese distributor to see if they’ll sponsor your event. Buy a grand prize and a few secondary prizes and sell raffle tickets to people. You can even ask businesses to donate items to include in the raffle to sweeten the deal. Even if the prizes are small, your supporters will appreciate receiving something in exchange for their donation to your cause. Do you or your partner have a unique skill that you could donate to people to raise money for your adoption? 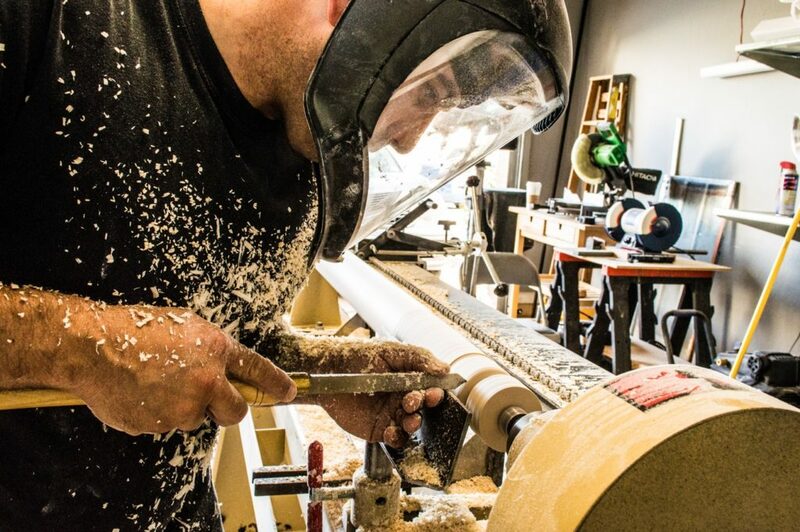 Whether you have a professional skill set or a personal hobby, donate this craft service instead! Common skills that we usually see people donate include – piano lessons, carpentry, marketing, website development, cooking, and lawn care. And the best part is, you’ll likely make more money than just charging for the service because people will want to support your fundraising efforts. Partner with a local company who offers wine and painting classes and host a fun night of creativity. You’ll be able to get people together for a fun evening of painting and delicious wine while raising money for your adoption. You’ll want to work with the company you partner with to figure out how to split the money, but from our experience, most places are very happy to work with you to help you raise the money you and your family needs. To make sure that your fundraiser is a total success, we recommend choosing the idea that you’re most excited about. This will help keep your motivation high as you’re doing all the planning, and it will make you more passionate when it comes to promoting your adoption fundraiser. People will always gravitate towards things that someone is overflowing with enthusiasm for.